Carolyn Moores, Professor of Structural Biology, writes about how academics in the Institute of Structural and Molecular Biology (ISMB) are using their new cryo-electron microscope to address big questions about antibiotic resistance, disease and life itself. 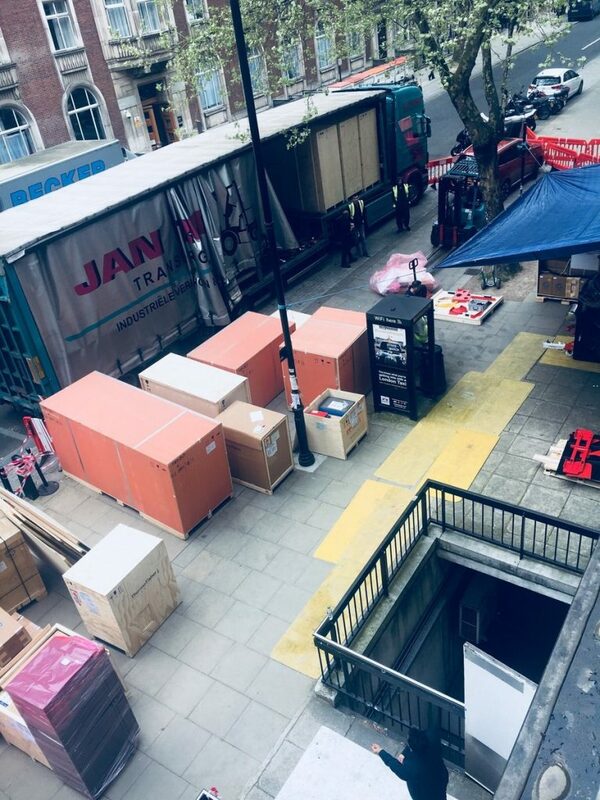 Tucked discreetly in a corner of the Malet Street Extension building, a new state-of-the-art microscope is generating Terabytes of high-resolution imaging data. 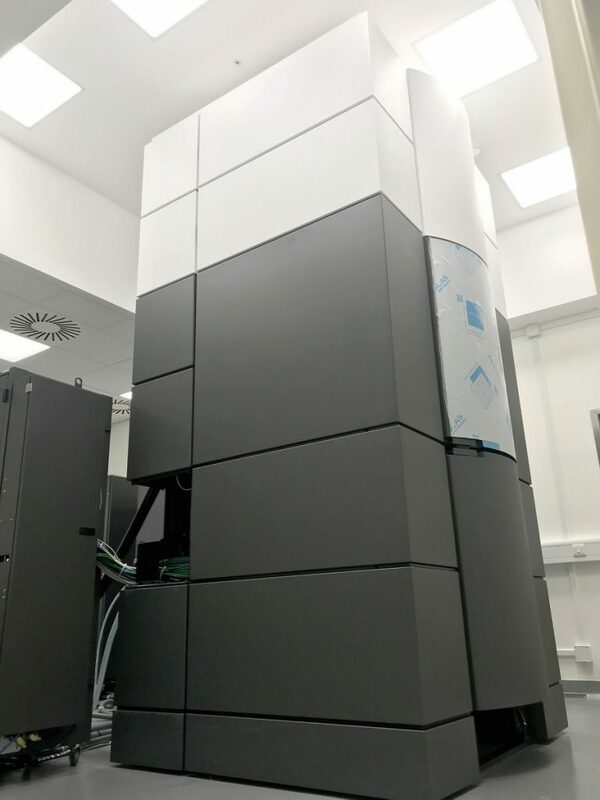 This £4M cryo-electron microscope (cryo-EM) is using Nobel Prize-winning technology to address a wide range of biologically and biomedically important questions. Researchers in the Institute of Structural and Molecular Biology (ISMB) are using it to study the molecular machines that are found within all living cells and that are essential for life. The ISMB – a joint research institute between Birkbeck and UCL – is internationally recognised as a centre of excellence for cryo-EM and for our research focused on diverse molecular machines. 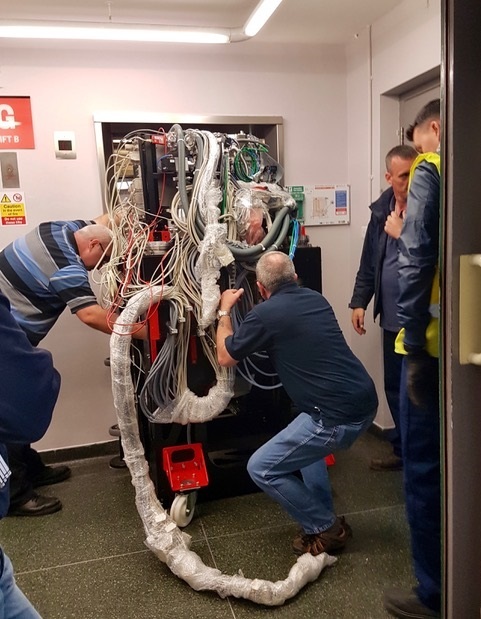 In 2016, we were thrilled to be awarded a grant by Wellcome which, together with contributions from Birkbeck and UCL, funded the purchase of our Titan Krios microscope. Delivery day, earlier this year, was a big moment for the whole team. Prior to its arrival, we had been working hard with colleagues from Estates and external contractors to prepare a high-spec room for its arrival. Our microscope travelled in its own juggernaut from the Thermo Fisher factory in The Netherlands, with its ~3,300 parts carefully catalogued and packed in 21 crates. With nerves jangling, we all held our breath as the largest and heaviest part of the microscope was squeezed into the lift, travelled one floor to the basement without mishap, and edged its way out again. Constructed by dedicated engineers over the course of 8 weeks like a very big ship in a bottle, this 4.5 tonne, 4m tall monolith is now steadily producing up to 4TB of data a day. Since its invention in the 1930s, electron microscopy has steadily improved in power and sophistication, and recent advances have moved this method to the forefront of structural biology. In particular, rapid freezing of samples to liquid nitrogen temperatures (~-195°C) allows sample preservation to be maintained inside the microscope, and provides some cryo-protection from the otherwise damaging effects of the electrons that are used for sample imaging. The cryo-EM field has undergone a technological revolution in the last ~5 years such that the application of this methodology has expanded enormously. The 2017 Nobel Prize in Chemistry was awarded to three pioneers in the field. Our new microscope brings many benefits. First, it is very stable: since the ultimate goal of our experiments is to visualize the position and organization of all the atoms from which molecular machinery is built, microscope stability is vital. Coupled to this, the Titan Krios is designed to allow automated data collection such that, after a few hours of set up, data collection experiments can be left to run for several days without user intervention. Previous generation equipment required trained microscopists to sit at the microscope for as many hours as they could manage. Since our structural experiments require many thousands of sample images to be computationally combined to reveal their 3D structure, this is gruelling. Implementation of sophisticated data collection software is much more efficient and strongly preferred by the microscopists! In addition, although still requiring expertise and training, the Titan Krios is user-friendly while not compromising on its high-end capabilities. Around a dozen ISMB researchers have already received training and are busy collecting data for studies on topics as diverse as cancer, dementia, antibiotic resistance and malaria. Understanding the structures of biological molecules and assemblies reveals how they work and makes it possible to design drugs or treatments for diseases. With new opportunities come fresh challenges. Because the new microscope produces high-quality data – and a lot of it – so efficiently, our focus has now shifted to the problem of producing high-quality samples that can be fed into the Titan Krios imaging pipeline. This now represents a major bottleneck for many projects, both because of the time intrinsic to sample optimisation and because researchers need to learn the skills in order to undertake this optimisation. We are now focusing on ways to allow more projects and more researchers at UCL and Birkbeck to benefit from the cryo-EM “resolution revolution”.